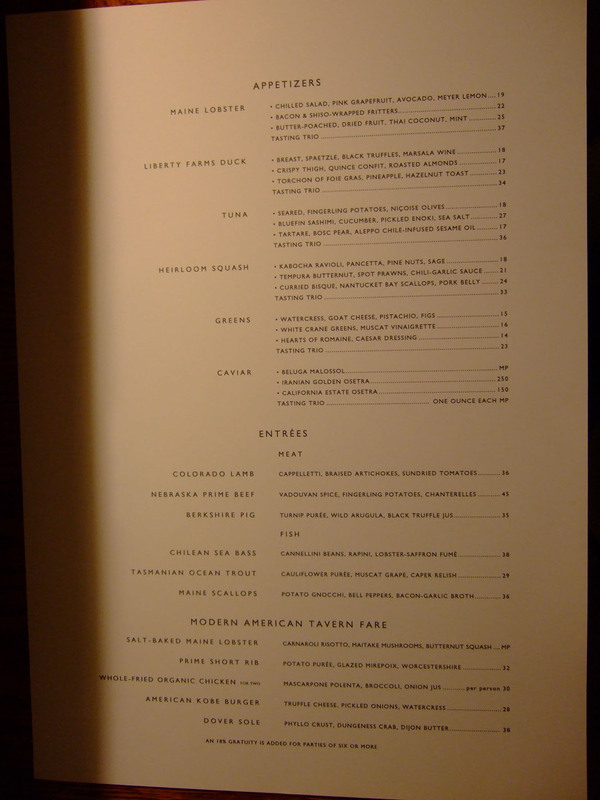 When I think of "hotel restaurant," I conjure up images of tired continental fare at the Hilton or a poor attempt of Asian fusion at the Marriott. Rest assured, Stonehill Tavern is not your typical hotel restaurant. Rather, in the space of the former Aqua at the St. Regis Resort, Mina has created an exciting new eatery serving his interpretation of modern American tavern fare. The space is sophisticated yet casual, sleek yet cozy, the perfect setting to introduce Southern California to Michael Mina. Designed by Tony Chi, Stonehill's space is suave, modern, awash in dark, warm wood, perhaps a nod to the restaurant's pseudo-tavern essence. 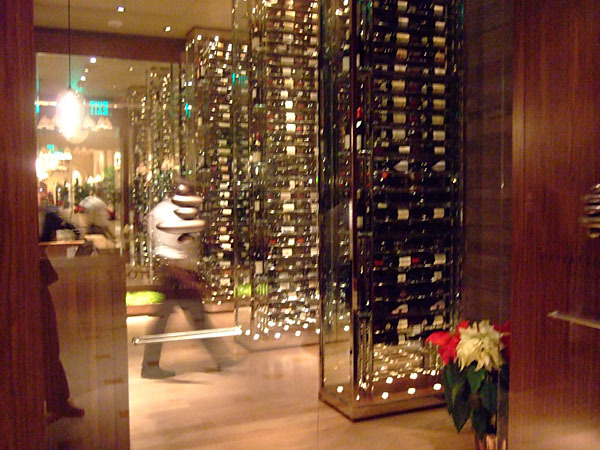 You enter amongst an impressive display of steel racks showcasing Stonehill's fine collection of wines. 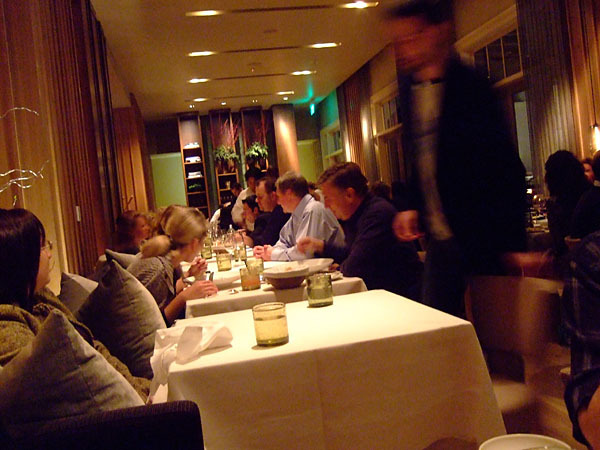 We were seated in the main dining room, overlooking the majestic Pacific. There is also a bar/lounge area with chic glass-encased booths and a private dining room replete with wood-burning fireplace. 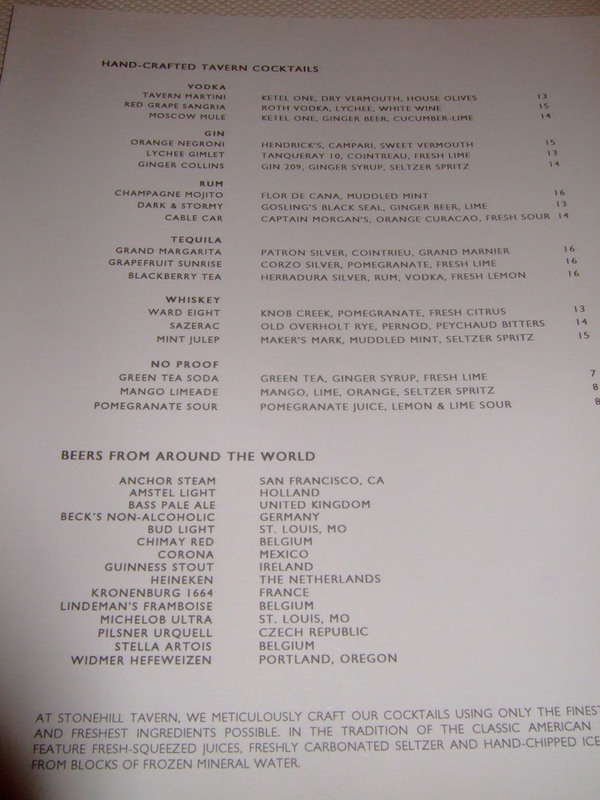 Here we have the cocktail menu, the regular menu, and the tasting menu. We started with two servings of Lindeman's (intense bouquet of raspberry jam leading to a sweet, lingering finish) and a Chimay Red (a dark-brown Belgian trappist brew with strong hints of coffee and nuts). 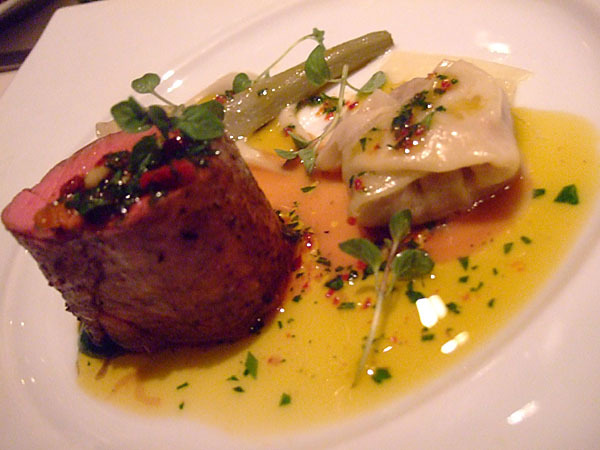 On the regular menu, note Mina's signature method of creating three variations of one main ingredient. 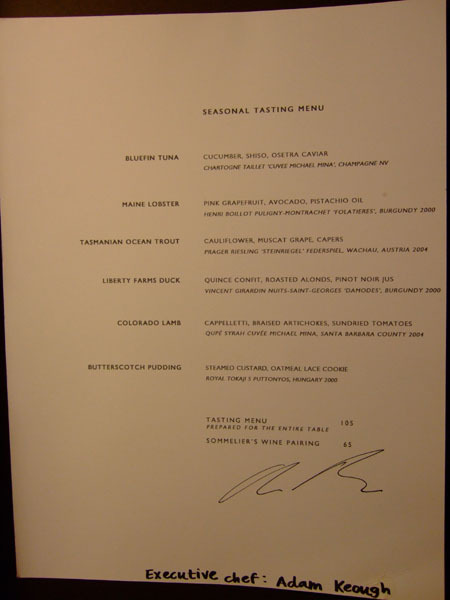 We were tempted to get the caviar tasting trio but then came to our senses (MP on beluga should scare most folks!). Also, we had no problems getting the tasting menu signed by Chef Keough after the meal. Click for larger versions. 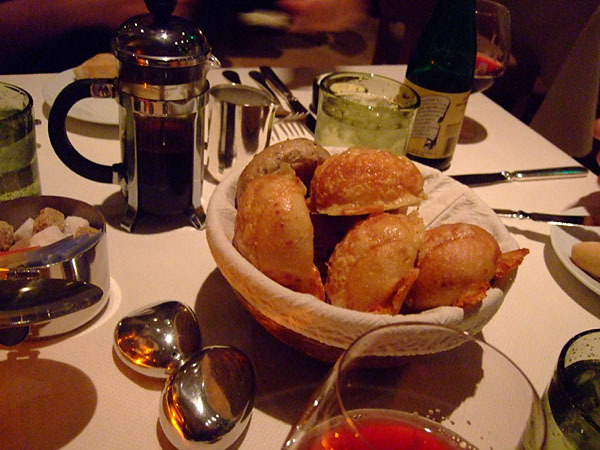 Left: The assortment of breads included olive, cheese, and French-style baguette. 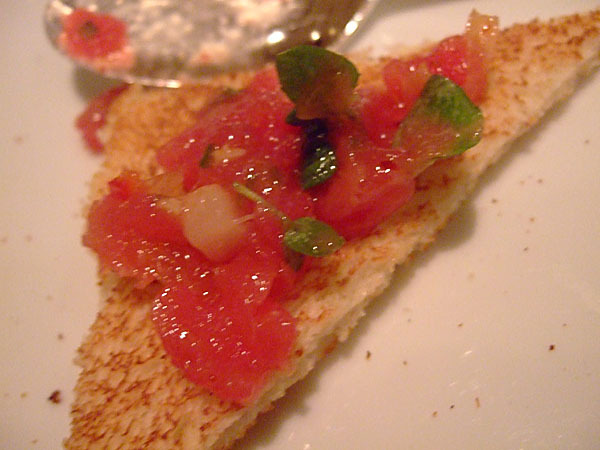 The olive and cheese varieties were especially flavorful and didn't even need to be accompanied by butter. 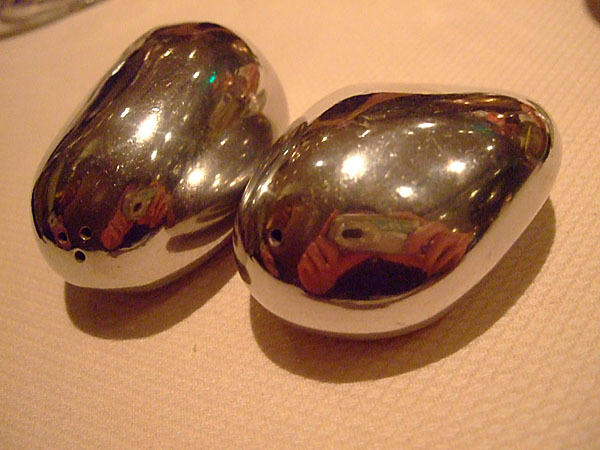 Right: Rather peculiar-looking salt and pepper. Made with toro and served with toast points, this was one of the specials of the day, which we ordered in addition to the tasting menu. Our server prepared the dish tableside, mixing the tuna with onions, jalapeños, pine nuts, and chili aioli before serving. The photos were taken post-mix; the initial presentation was much neater obviously. I didn't get the typical fatty, oily flavor that I typically get with toro, probably due to the copious amount of garnish applied. In my opinion, toro should be served more simply, to let the flavors of the fish dominate; here I would have a hard time differentiating this from a regular cut of tuna. 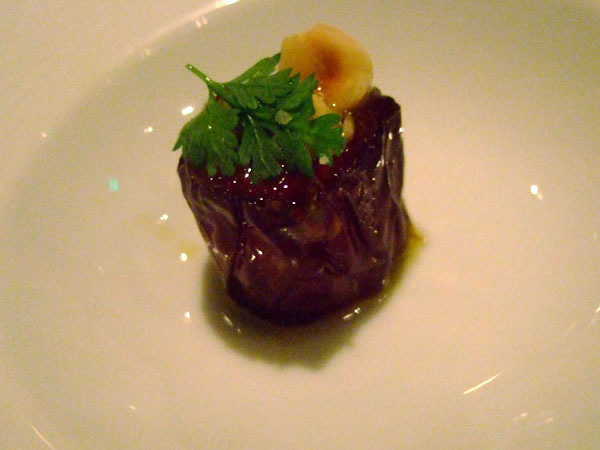 Our amuse consisted of foie gras creme encased in Medjool date, topped with hazelnut. 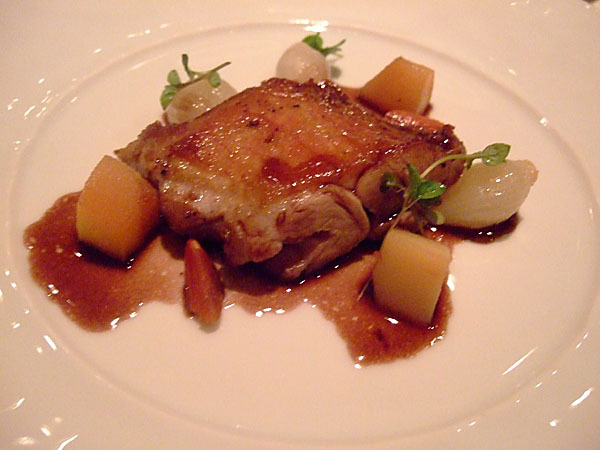 The flavor of the foie was very subdued, with the taste of the date dominating. Nice. 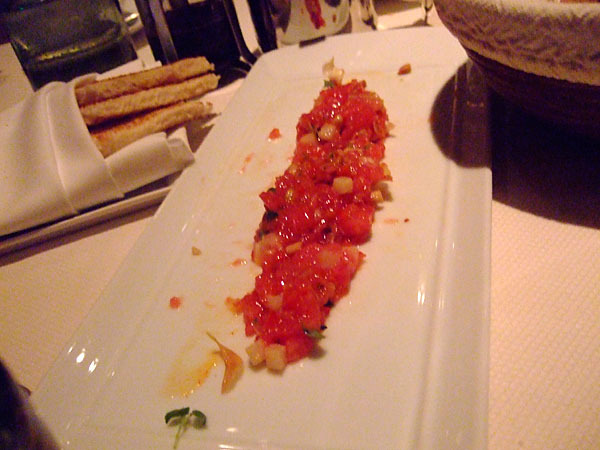 Compared to the tartare, this was a much purer presentation of tuna: let the fish take center stage. 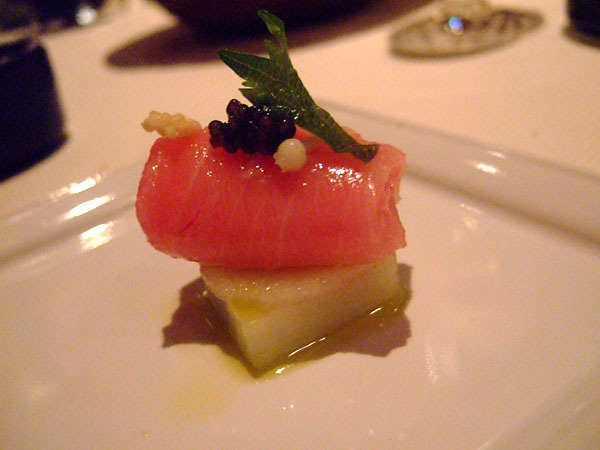 The caviar imparted a saltiness that contrasted nicely with the mildness of the bluefin while the small bit of crispy rice added a welcomed crunch to the dish's texture. The Champagne had a strong nose of peach that belied its quintessentially brut finish, a pleasant pairing. 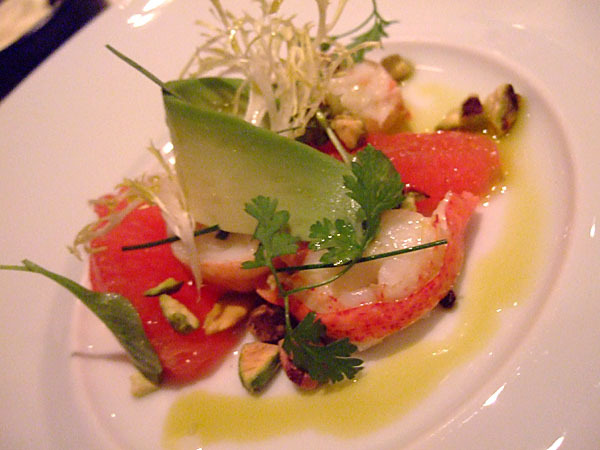 The lobster had a delightful texture and provided a nice foil to the grapefruit and avocado. However I wasn't quite as sure about the addition of the pistachio. The white Burgundy paired with this dish was interesting. Initially, the wine had a super-intense, mineral, earthy nose that was reminiscent of refuse according to one of my dining companions. However, once the wine opened up a bit, we got more fruit and even tasted hints of sauternes. 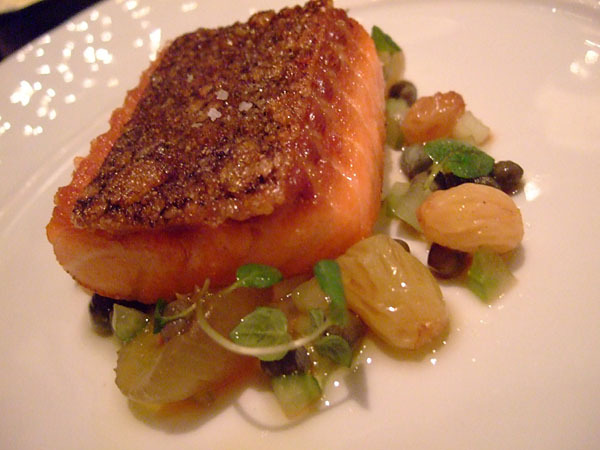 The entire table found this quite evocative of salmon, in texture, taste, and appearance. 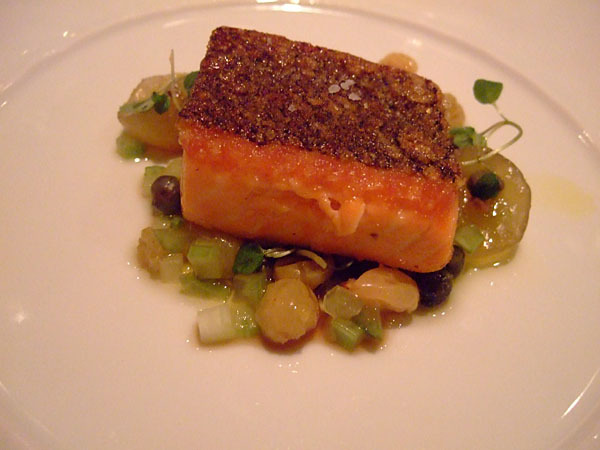 However it still maintained typical trout qualities (such as the skin) and was enjoyed by all. The Riesling had a floral, fruity, mouthwatering aroma that led to a spicy, dry finish; it went well with the fish. This was probably my favorite dish of the night: tender, fleshy, succulent, and full of flavor. I have no qualms saying that this may very well be my number one experience with duck, though one member of my party thought it could've been juicier. 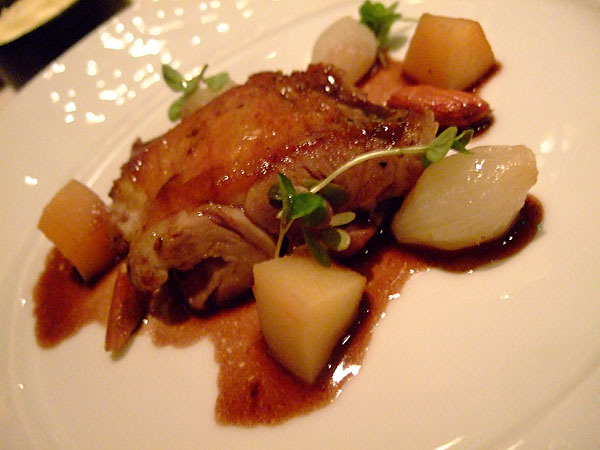 The Pinot jus with the duck connected nicely with the paired Burgundy. A favorite among several members of my party, the lamb was a highlight for me as well. The meat was delicate, juicy, flavorful and was some of the best lamb I've ever had. "Cappelletto" means "little hat" in Italian and indeed, that's what this dumpling-like contraption resembles. Related to the more popular tortellini, the cappelletto is a stuffed pasta, in this case stuffed with the same delectable lamb. The Syrah went well here, it was spicy and forward, though perhaps a bit tannic. This was also a special, apparently the real deal from Japan, at $15/oz. We were told this was graded A5, the highest in the Japanese system (USDA Prime grades around A1/A2 I believe). 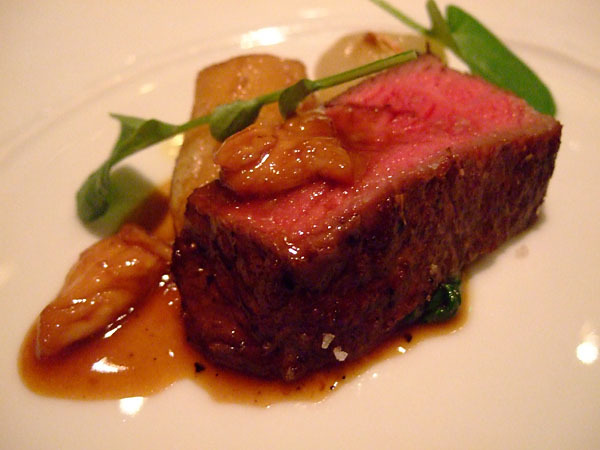 The beef was served with chanterelles, cipollini onion, fingerling potatoes, and just a pinch of sea salt. The meat was juicy, tender, and flavorful, but lacked the typical unctuousness, marbling, and rich, gelatinous texture of the Wagyu breed that I'm used to. Perhaps this demonstrates the difference between a sirloin and the tenderloin cut that I usually get. As for the Cabernet, I ordered it separately by the glass; I found it to be a typical expression of California Cab: slight floral nose, medium fruit, softer finish. 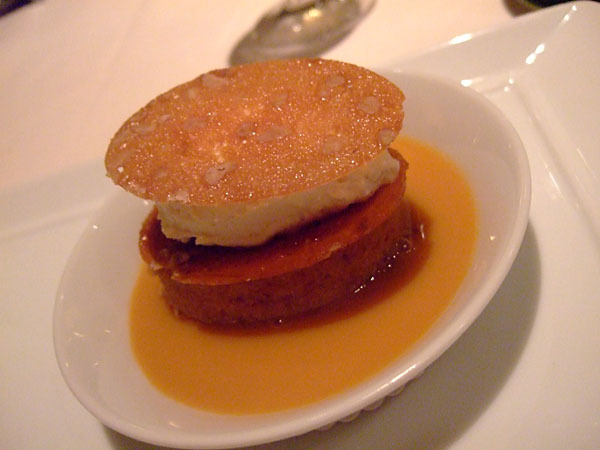 The oatmeal cookie was topped with crème fraîche and a tuile. 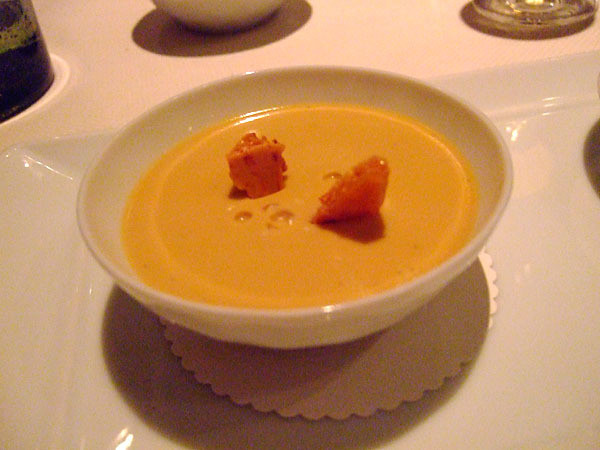 It was tasty but I much preferred the pudding, which was served slightly chilled, accentuating the intense, pure flavor of the butterscotch. The pairing of the Tokaji was a good but safe choice. Also I do enjoy Tokaji, I am seeing it a bit too much these days and would've preferred a more creative match, perhaps something like a Muscat. 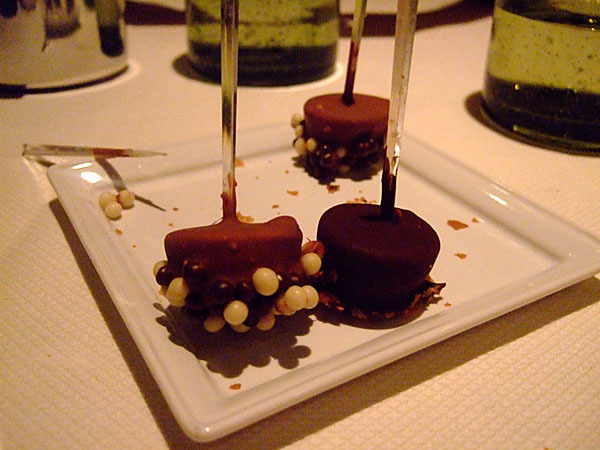 Two varieties: milk chocolate (garnished with dark and white chocolate spheres) and dark chocolate (topped with toffee). Ice cream filled and a fun, wonderful way to end the meal. Michael Mina's restaurant empire spans a myriad of locations. With so many eateries operating at once, I had some concerns that there would be problems keeping up quality and consistency. But that was not the case; and in fact, according to our server, Mina meets regularly with every one of his restaurants. 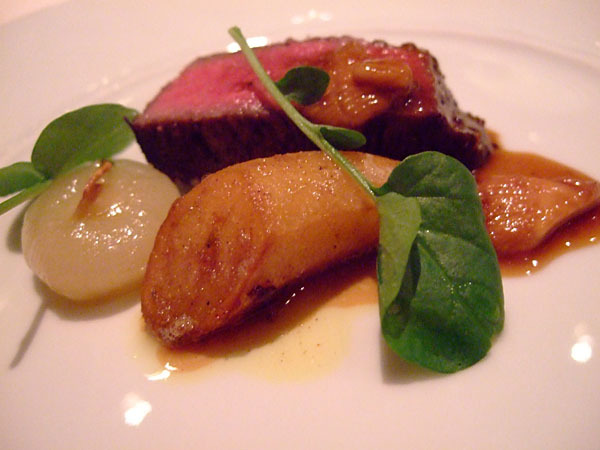 With Stonehill Tavern, Mina has exceeded my expectations and redefined what I expect from a mere hotel restaurant. But Stonehill is a great restaurant, not only among hotel eateries, but overall, and stands without qualification. 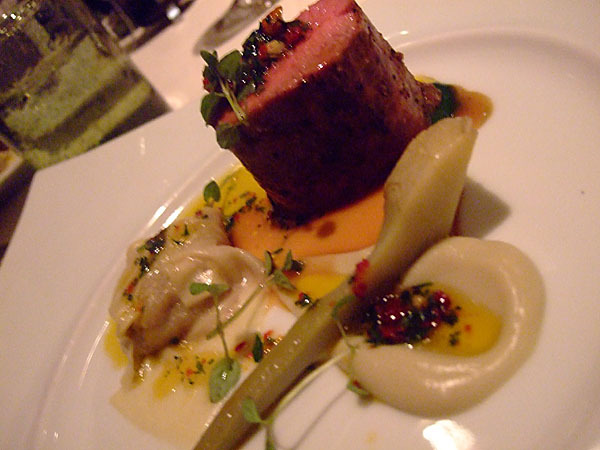 I do not hesitate putting it among the very top restaurants in Orange County. Aha ! So you DID eat here as well as at Studio ! Indeed! I need to go back sometime though. Here, or Studio at the Montage. This looks like an exotic places to be visited when you are willing to have some quality food. This is the ultimate place where I am always interested to go for the exotic dinner. This blog has given me a lot of info that I will well. Want amazing games?, download unblocked games 66 at games.lol.